“The size of the middle-income tier varies over time because the incomes of individual households, in relation to the overall median, vary over time. In 2011, 50.7% of adults (ages 18 and older) lived in middle -income households (see top chart above). In number, that amounted to 117 million adults out of the U.S. household population of 231 million adults. The share of the U.S. adult population that lives in middle-income households has diminished over time. 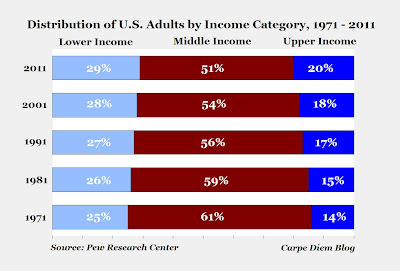 In 1971, 60.8% of adults lived in middle -income households, 10 percentage points more than in 2011 (see top chart). The shrinking, or hollowing out, of the middle –income tier has been accompanied by an increase in the shares of the adult population at the high and low ends of the income distribution and roughly equal shares have moved up or down. The share of the population in the upper-income tier has risen from 14% in 1971 to 20% in 2011. At the same time, the share in the lower-income tier grew from 25% in 1971 to 29% in 2011. Thus, from 1971 to 2011, the U.S. adult population has become more economically polarized with relatively more in the top and the bottom tiers, and fewer in the middle. 1. 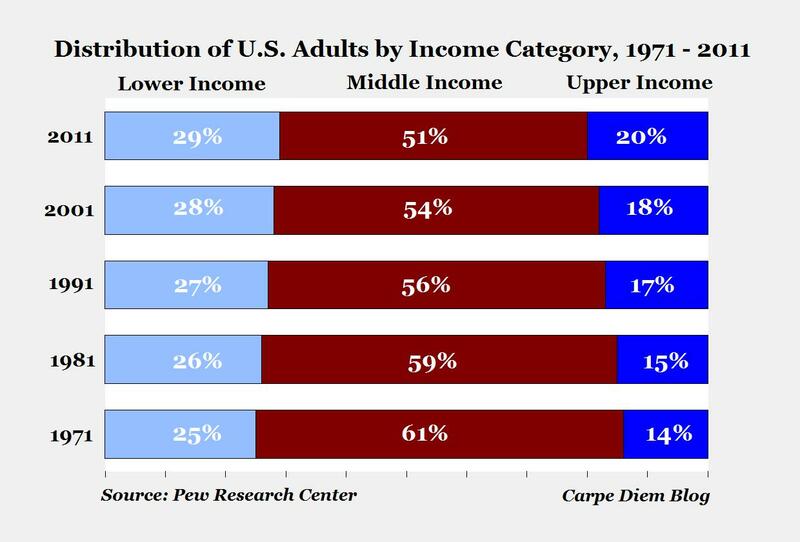 In 1971, 86% of adult Americans were considered either lower-income or middle-income, and by 2011 only 80% of Americans were in those two income categories. At the same time, the percentage of “upper-income Americans” increased from 14% to 20%, reflecting significant upward income mobility during those 40 years as millions of Americans left the middle class for the upper-income group. 2. Between 1971 and 2011, the share of adult Americans in the “middle class” decreased by ten percentage points from 61% to 51%. Of that 10% of American adults who left the middle class, 6% moved up to the “upper-income” category and 4% move down to the “lower-income” category. Alternatively, we could also say that 150 American adults moved up from the middle-class for every 100 adults who moved down from the middle-class between 1971 and 2011. Or we could say that in that 40-year period, it was 50% more likely that an American adult would move up from the middle class to the upper-income group than he or she would move down to the lower-income group. 3. Using the numbers in the bottom chart we could also say that if the 1971 income distribution percentages (25.2%, 60.8% and 14%) hadn’t changed, then in 2011 there would have only been 32.35 million upper-income American adults (14% of 231.1 million) instead of the actual 46.31 million Americans in that category today (20% of 231.1 million). So instead of characterizing the shifting income trend as the “shrinking, or hollowing out, of the middle –income tier,” we could also characterize it as a period of significant upward mobility, during which an additional 14 million Americans moved into the upper-income tier. Of course, we could also say that if the 25.2% of American adults in the low-income group hadn’t increased to 29.3%, we would have about 9.5 million fewer lower-income American adults today. But like I mention above, about 50% more American adults moved up to the highest group than moved down to the lowest group. In other words, Pew’s statement that “roughly equal shares have moved up or down” isn’t really accurate (6% moving up is not roughly equal to 4% moving down). It would be more accurate to say that it was about 50% more likely that an American adult moved up from the middle class to the upper-income group than moved down from the middle class to the low-income group between 1971 and 2011. Bottom Line: Far from being gloomy, perhaps there’s a positive story here. A story that over the last forty years there has been significant movement by income category among American adults, as would be expected in a dynamic economy, with movement going in both directions. But on net, the changing income dynamics have been positive overall, with about 150 Americans moving up for every 100 Americans who moved down. I see the positive trend in income mobility, however, it is depressing to read these reports and see the victim mentality statistically represented. I did find humor in the "The Lost Decade" report where people blame Congress for their problems and then expect a solution from the same bunch! One stop shop, trade in an old problem for a new one. MP, I agree with you 99% of the time, so please accept any disagreement or alternative viewpoint as a rare exception. That being said, the bottom line is also that 9.5 million additional Americans are in poverty over a period of time when increasing productivity and GDP growth should have permitted more boats to rise. Of those lower income folks, we should also recognize that those folks are much better off in 2011 compared to 1971, because of improvements in affordability of everything ranging from appliances to clothing, as well as improvements in technological capabilities. Just because an extra 4% of folks are considered to earn a lower income does not mean that their quality of life in 2011 is worse compared to how they would have lived as a lower-middle income earner in 1971. The point is not whether they live better. The point is whether their rate of improvement is proportional. If the very bottom are 1% better off and the very top is 1000% better off, then it is hard to argue that the free market is "working". Of course more people moved up than down. There is a floor under the bottom, and no restraint whatsoever at the top. Should have permitted more boats to rise is a goid way to put it. It seems to me that there must come a point when additional wealth hurts the rich. When they have hoarded so much that fords workers can no longer afford to buy a ford car. Yes, i know it is a growing pie. . At some point, it does not matter because the ratios are growing faster than the pie. Is it possible that what we see on this chart is the baby boom aging and retiring? Of course the percentage of low wage earners will decline when you consider our current demographics trends. Also, I started in the bottom rank when I was out of college, went up to the middle after law school, and then have probably moved to the top level now after more than 10 years successfully practicing my profession. How does that affect this? Another one - how is this affected by household size, I see it mentions it is adjusted for size, but not sure how. One more - does this study include total compensation or just straight monetary wages - in other words, does it include the cost of health insurance usually provided by employers, retirement benefits, etc.? If not, than it is completely borked. Ok, last one - without looking at the actual adjusted dollar amounts, there is no way to compare the lower wage earners from 40 years ago to now. And the whole thing just smells funny - is the point that the tales are growing? If the tide is rising for all boats, wouldn't we expect the bell curve to be smoothing out some? Class in the U.S. is a myth - or worse, it is a Marxist artifact. There is no middle class. People move up and down throughout their lives. Don't be trapped by Marxist theoretical frameworks and language. Naw, there's no lipstick for this pig. Median household income has been falling since 1999. You can slice it and dice it any way you want, but the middle of the middle is getting poorer. “The Lost Decade of the Middle Class: Fewer, Poorer, Gloomier” since 2000 is a political statement not an economic one. The lost decade began when the economy peaked in Dec 2007 and worsened substantially and unnecessarily under Obama. In 2001-07, U.S. living standards improved at a much faster rate, in part, because the U.S. consumed up to $800 billion a year (or up to 6% of GDP) more than produced in the global economy. Also, the U.S. economy became much more efficient after the quick and massive creative-destruction process, mostly from 2000-02. So, less effort was needed for a higher standard of living. It should be noted, over the past three decades, there was massive immigration to the U.S. of mostly poor people from Third World countries, which would lower median income, although living standards of poor immigrants were raised. Moreover, I may add, there's an "unfairness" of poor countries being forced to invest in rich countries, e.g. the U.S.. The U.S. budget should be balanced over each 10 year period, i.e. spending equals taxes over each one decade period. Ah...this Pew Report is pretty pew. Hasn't family size changed since 1971? And I'm pretty sure the people in the study today are not the same people as in 1971, so we can't really say what happened to those people. The lower category could have increased because we let in a lot of impoverished immigrants (which is a good thing). And I don't understand the left's obsession with gluing everyone who isn't a movie star or a politician to the middle. What's the fascination with striving for average? And more importantly, trapping everyone sandwiched in the center? "The point is not whether they live better. The point is whether their rate of improvement is proportional. If the very bottom are 1% better off and the very top is 1000% better off, then it is hard to argue that the free market is "working"." So what's the answer? Figure it out and let us know. Heaven forbid that the well-being of some should improve more than that of someone else! "It seems to me that there must come a point when additional wealth hurts the rich. When they have hoarded so much that fords workers can no longer afford to buy a ford car." Yeah, we can only hope so, eh? (/sarc) What do those Scrooges do with all that wealth while they are hoarding it? ...can no longer afford to buy a Ford car? Learn some economics. "That being said, the bottom line is also that 9.5 million additional Americans are in poverty over a period of time when increasing productivity and GDP growth should have permitted more boats to rise." No. 9.5 million additional Americans are in the lower income tier - not poverty. We have no indication of how poverty numbers changed, if at all. "The question I would pose is; Are there policies that can be implemented that will serve to move more Americans out of poverty while protecting the fundamental economic principles that maximize economic growth? (not eloquent but hopefully the concept comes across)"
Yes, and they are those policies that would reduce government regulation and interference in markets that prevent people from making a living braiding hair, threading eyebrows, building caskets, operating mobile lunch trucks, selling hotdogs, operate pedicabs, and many other innovative ideas discussed frequently on this blog. "Naw, there's no lipstick for this pig. Median household income has been falling since 1999. You can slice it and dice it any way you want, but the middle of the middle is getting poorer." Rufus pastes his standard comment for this topic. How did I miss the gem? I don't feel the pain yet, but I'm a pauper compared to Warren Buffet. Let's go ask him, Bill Gates and George Soros if they're suffering from choking on all their hoarding all the wealth in the companies they invested in which employ people to produce stuff that other people want to buy. God, that's gotta be painful, eh? "Yes, i know it is a growing pie. . At some point, it does not matter because the ratios are growing faster than the pie." That's not possible if everyone's piece of pie is getting bigger. Probably neither here nor there, but... It would be interesting to compare what the lower earners of 1971 had or could afford compared to the lower earners of 2011. Today's lower earners have cell phones, internet access, more fuel efficient cars & homes, cheaper food (adjusted for inflation), etc. I'm guessing the difference today between what lower earners have/can afford and what middle earners have/can afford is probably vastly smaller than it was in 1971. I'm with Marko on this one - there are so many unanswered questions about the methods used to generate this data. There is also the strawman argument that somehow there is a correct distribution. Don't know how difficult it would be to generate but I would like to something engineers did called Time at temperature, i.e. how long was this particular piece of metal was at a particular temperature. For the economic side it would be once someone was 18 how much time is spend at each income amount. This would be a more meaningful data point than this type of snapshot. I'm guessing the difference today between what lower earners have/can afford and what middle earners have/can afford is probably vastly smaller than it was in 1971. You are correct. Check out the paper I linked to in the very first comment. They are acting like the age distribution is constant. Young people, older (retired) and recent immigrants will have lower income. The trend to later marriage and divorce means "household" is no longer the same indicator it was previously. For example, the top tier of "household" incomes typically have two incomes. This also ignores transfer payments. I remember 1971 and people would buy you out if you had a garage sale, but now they pick it over, even "lower income" people, and most remains unsold. I remember the fleet of cars on the road was full of rust holes and making all sorts of noises and the side of the highway had many broken down cars. To say today is worse off is simply willful blindness. I suggest the best course to take are policies that encourage new wealth and greater income creation. Out of curiosity, what kind of policies do you have in mind? Any suggestions? The bar chart and table shown are worthless, here's why. The authors note that median household income rose from $45k to $59k from 1971 to 2010, after adjusting for inflation and household size. They then use the thresholds of two-thirds to twice medium income to determine the lower, middle, and upper tiers. That means that their definition of middle income is $30-90k in 1970 but has been upped to $39-118k in 2010 (page 64). Note again that this is inflation-adjusted 2011 dollars, after adjusting for how households have fallen in size over the decades. That means if you made $35k in 2011 dollars in 1970, they consider you middle income, but if someone makes that same amount now, they consider it lower income. Why move the goalposts? Because you don't care about showing that people are objectively better off than they were 40 years ago, you want to stir up envy that the upper tier has done even better over that time frame. Marko, to address some of your points, they do note that the demographic group that gained the most over those 40 years is those 65 and older, no doubt as the baby boomers have done well, not to mention the ridiculous entitlements like Medicare that give them even more benefits. As for household size, they note in Appendix 2 that they divide by the square root of average household size during each of the given years and calculate their charted numbers for a three-person household. As for health insurance and other benefits, Appendix 2 also says that "Noncash transfers, such as food stamps, health benefits, subsidized housing and energy assistance, are not included." Rufus, yes, median income fell since 1999, but why are you picking 1999? That was a peak driven by the irrational dot.com bubble, why is that your standard? If I take the last trough before that, in 1993, the median has grown by $5k since then, about 10%. MP's postings on the economic benefits of an open energy policy are a prime example of policies that will create additional incomes and wealth by substituting a domestic, material, labor and equipment intensive product for one that is currently imported and, perhaps more importantly, by lowering production costs in a myriad of businesses and industries thereby improving their global competitive capabilities as well as lowering inflation costs and raising everyone's standards of living. It seems ludicrous to import 6mbd of oil when we could be producing it ourselves and generating the jobs, incomes, general economic activity, federal.state & local tax revenues, equity market cap wealth, royalty fees, lower inflation, stronger dollar, etc. etc. that would come from domestic production. Regardless of one's climate change belief system, there should be an understanding of these benefits. Another example, one that many of your will disagree with, but that I favor, is the Earned Income Tax Credit in lieu of a higher minimum wage. The EITC encourages and rewards work effort but it does not penalize the new wealth creators in the economic sector. Businesses pay employees for what is the true value of their labor contribution and government (yes, we the taxpayers) supplement this income to partially offset circumstances where the value of an individual's labor contribution is not sufficient to prevent that person and their dependents from living in poverty. Why this compulsive, micro-focused interest in where someone is economically relative to someone else? A "middle class" household in 2011 enjoys a much higher living standard than such a household in 1971. In 1971 I had one car in my household, a 13 inch TV, didn't make long-distance calls without planning, didn't travel cross country on an airplane very often, had to take a bus to a library to do research, and would have died from conditions I now treat with medicine. You guys sound like people who would go to a restaurant that offered complimentary dessert and spend the evening arguing over whether the people at the next table got bigger pieces of cake. Obligatory comment about the inflation rate that was used is substantially low. "Obligatory comment about the inflation rate that was used is substantially low." Outright claim that your point of view is equal to that of Adolf Hitler. Borderline sexual harassment comment questioning your sexuality. We now return you to your regular scheduled programming and remember: don't be a douchebag. For some reason, that does not surprise me. You would likely be surprised how different I am from 'bart'. Read the Stanford study linked in the first comment. 1. The CBO measures do not subtract taxes paid, nor add income from most welfare programs. They ignore most of the social programs and tax policies which already address inequality. 2. Better measures of income (adjusted for the first point) show a decline in inequality, not an increase. 3. Using Consumption as the basis for comparison, the Ginni is 0.28, "almost 30 percent lower than the Gini for comprehensive income, and about 40 percent lower than the Gini for money income". OK, the problem, of course, is that we're looking at statistical categories, not people. For example -- how many of those "added" to the lower class are immigrants or illegal immigrants? If this class has increased substantially -- and it's a fair bet it has -- then perhaps it's not that the middle class is moving down, it's that the middle class is moving UP, and that the newcomers aren't starting out in the middle class... which seems reasonable in the first place, since the dominant immigrant groups coming here from the south aren't generally coming from wealthy countries. As Dr. Perry has noted many times before, the real thing to grasp is that income classes are statistical groupings, not people -- and to look only at shifts among statistical categories is to risk missing what's really happening all around. This, Ron, is one of the main problems with The Left and bleeding hearts in general. They believe they can feeeeeel the answers to complex questions, rather than doing the hard work it takes to understand them by using the primary tool that makes you not an APE... Math. While chimpanzees have been taught to do arithmetic, the facility with which a 5yo manipulates numbers with inherent understanding of them as abstract concepts dwarfs that of a well-trained chimpanzee at the peak of their intelligence and training. Learn to do math, or remain forever as stupid as apes. It's not so much that you USE it directly, it's the feel for numbers and the associated critical thinking skills produced alongside it that make it valuable. Also the study looks at pre-tax income, and ignores tax credits and transfer payments. Very different picture emerges after considering the effects of taxation (or lack thereof, in many cases), as well as the effects of transfer payments. Looks like the data isn't agreeing with Perry's optimism. That can be changed given the wide reach of the US government and its military/intelligence assets. It's kind of hard to hide when there's nowhere on earth the US can't repatriate it back. Tempting the IRS to have a lengthier chat with the DoD - through attempting to hide things - is not the wisest idea. "We now return you to your regular scheduled programming and remember: don't be a douchebag." Hmmph. That was too short. I wanna better part next time. "Looks like the data isn't agreeing with Perry's optimism." "That can be changed given the wide reach..."
Meaningless drivel not responsive to the quoted sentence. I agree with Sprewell on the moving goal posts and Peak Trader on the immigration impacts. Almost 30 million people moved in to high income group from middle class; All 33 million low income people moved into middle class; and we added 90 million people which many came from what we in America would call below low income. These immigrants are now starting their climb toward the good life. This surely is too optimistic, but balances the author's pessimism in the report. Learn some math yourself. I solve problems involving changing ratios. I have a spacecraft exploring the inner planets. As it gets closer to the sun its solar paneks make more power, so the pie us growing. But the power and the cooling requirements of the components on board are changing, assymetrically. If i do not keep the proper balance, the entire mission fails or suffers losses. There is no point in keeping command and control at full power if it does not leave me enough power to run the attitude control system.. It does not matter if you do well in your law practice. If the bulk of people who started off with you are unable to make similar gains, compared with previous times then the balance of opportunity has shifted. That is what the gross figures on income distribution are telling us. "I have a spacecraft exploring the inner planets. As it gets closer to the sun its solar paneks make more power, so the pie us growing." Your solar is paneking because you're getting too close! Move further away. "I solve problems involving changing ratios. " Let us know when you complete one. "But the power and the cooling requirements of the components on board are changing, assymetrically. If i do not keep the proper balance, the entire mission fails or suffers losses. There is no point in keeping command and control at full power if it does not leave me enough power to run the attitude control system.."
This is very imaginative and a fun read, but isn't useful in explaining income inequality. The whole pie is merely the sum of all the individual incomes, so unless some group is making less than before, the rate of change between low incomes and high incomes cannot be greater than the rate of growth of the whole pie. "It does not matter if you do well in your law practice." "If the bulk of people who started off with you are unable to make similar gains, compared with previous times then the balance of opportunity has shifted. That is what the gross figures on income distribution are telling us." The bulk of the people who started with him got a worse public education than previous groups, aren't willing to work as hard as previous groups, and unlike previous groups, have learned that they need not take responsibility for themselves because they are victims of an unjust system, and it's not their fault. Opportunity has nothing to do with it. A rising tide can't lift all boats, because some boats won't float. If you subsidize something you get more of it. It is no big surprise that with an increase in income distribution that has increased the welfare state that you get more people in the lower tier. The measure of wealth distribution does not take into consideration effort, commitment, risk taking, etc., all things that some people will not do when the government is giving them money for doing nothing. I was referring to the data referred to by Dr. Perry in this post. While it may reflect some optimism, the data indicates a hollowing out of the middle when visualized. It is not meaningless to note the futility of trying to hide(things) once you've pissed off the remaining superpower in the world, the United States. I was referring to arbitrage789's post on that matter. I would like to see the correlation to education level and or type of degree. My speculation is that the increase in the "lower income" and increase in "upper income" has a R2 of >0.9.